Visual Lure was recently contracted to design a website for a new preschool coming to O’Fallon, Illinois. 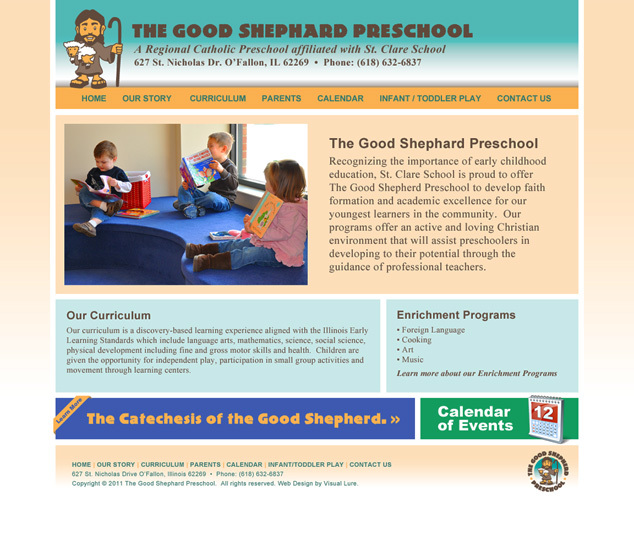 The new preschool will be called The Good Shephard Preschool and will be affiliated with O’Fallon’s St. Clare School. It will be located in the new Fellowship Centers at St. Nicholas Roman Catholic Church. Below is our proposed home page design. Check back soon for the new website. Update: The new website has gone live and can be viewed at www.gspreschoolofallon.com.